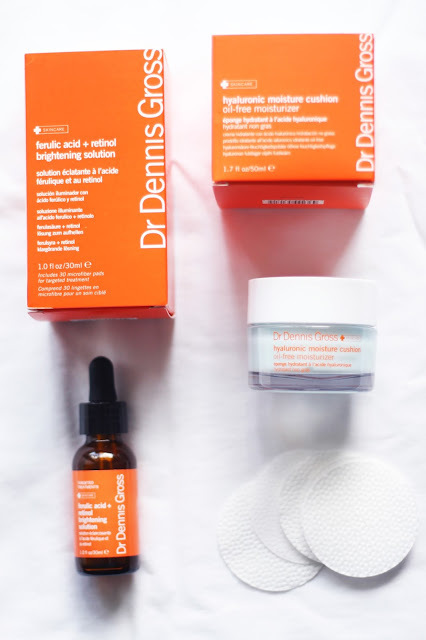 I have a skincare update/review today with two new products from Dr Dennis Gross. I have been using the same range from Dermalogica (read my post here) for over a year now and I still absolutely adore it and my skin is still in great condition. However I'm turning 27 this year and thought maybe its time to start adding some products that tackle anti-aging and brighten my complexion. 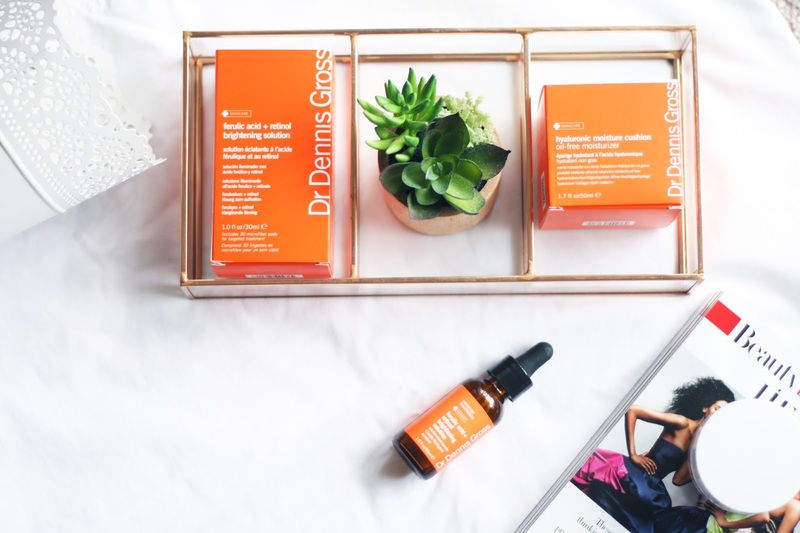 I've never heard of Dr Dennis Gross before until I stumbled across the range whilst in Sephora, instantly attracted by the gorgeous orange and white packaging I just had to find out more. Whilst on their website I noticed that they are a cruelty free brand and most products are vegan, they use advanced ingredient combinations and medical grade solutions which don't irritate the skin. Also while scrolling through their Instagram account I noticed a certain Olivia Palermo is a big fan of the brand, I was sold instantly her skin is perfection! 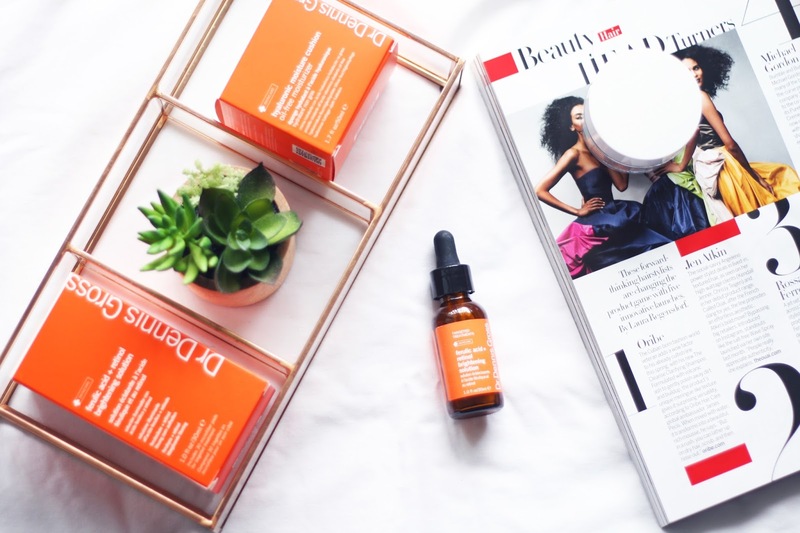 Ferulic Acid + Retinol Brightening Solution | Retinol creams are everywhere at the moment and are highly recommended for treating wrinkles and uneven skin tone, but what is Ferulic acid and why do we need it? Well according to Dr Dennis Gross 'Ferulic acid boosts Retinol's benefits, creating a groundbreaking formula that dramatically treats surface imperfections, such as fine lines and wrinkles, and goes beyond to enhance skin elasticity and firmness'. This product is recommended for daily use, I've been using it at night time as an all over treatment under my moisturiser. I use a few droplets and gently massage it all over my skin, the serum quickly absorbs into my skin leaving it feeling soft and ever so slightly fuller. The real results show in the morning, my skin is noticeable more brighter especially around the eye area and nose. I have only used this product for two weeks now but I am already so happy with it, I can't wait to find out how my skin looks in a few months time. This is a expensive serum and retails for $88 for 30ml but since I only use a few droplets I think this bottle will last me a few months at least. Hyaluronic Moisture Cushion | I picked up a moisturiser as I was on the verge of running out and this one seemed to be the perfect fit for my excessively oily skin. Why do you need this product? Well the box says 'this product works twofold to restore hydration to your skin by drawing in moisture, then sealing it in to keep it looking dewy and supple throughout the day'. This product is again recommended for daily use at both AM/PM, however I only use this in the morning. After use my skin feels hydrated and supple, the perfect base to put my make up on. Throughout the day my skin still looks dewy and feels lovely and soft without excess oil which I normally have to deal with. The gel like consistency absorbs quickly which is perfect for busy mornings, both products smell fresh but not invasive. Again this moisturiser is on the pricey side at $58 but I think this is well worth the money. I feel so happy that I came across these products as they were the perfect items to spruce up my routine and give me amazing results. If you are after treatments for fine lines and uneven skin tone I would give these ago.